Terms and conditions for the 20 July - 03 August 2018 Seasonal Spuds Facebook competition. This competition is open to legal residents of the UK, Channel Islands, Isle of Man and Republic of Ireland aged 18 years or over, except employees of Branston Ltd, their families, agents or anyone else professionally associated with the draw. To be entered into the draw, entrants must like the Seasonal Spuds Facebook page and comment on the ‘serving bowl and salt & pepper shakers’ Facebook competition entry post with their favourite recipe from the 2018 version of the Cornish New Potato recipe ebook. Closing date is 03 August 2018 at 12pm. One winner will be drawn at random from all eligible entries received by the closing date. Late, illegible, incomplete or corrupt entries will not be accepted. No responsibility can be accepted for lost entries and proof of transmission will not be accepted as proof of receipt. All entries must be received by 12pm on Friday 03 August 2018. The winner will be notified within three working days of the closing date of the competition and will be notified on the Facebook page. Winners will be required to confirm their acceptance of the prize within fourteen days of communication by providing a postal address. If unclaimed or declined fourteen days after confirmation, the prize will be cancelled. The name and county of the winner can be obtained by sending an email to media@branston.co.uk quoting Cornishware Social Media Competition Three in the subject line. This will be available during August 2018. 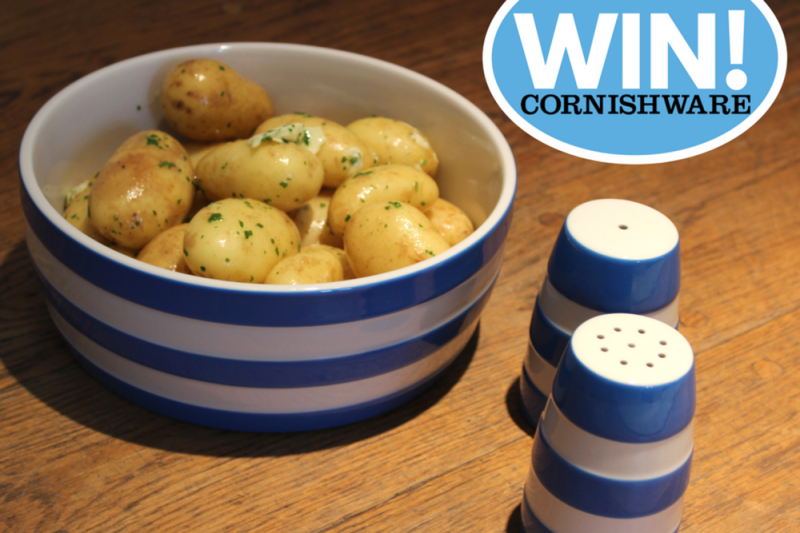 The winner will receive one Cornishware Cornish Blue deep bowl and one Cornishware Cornish Blue salt and pepper shaker set. All elements of the prize are subject to availability, non-transferable, non-negotiable and there are no cash alternatives. By entering, the winner agrees to participate in any publicity arranged by the Promoter or by its agencies. If you are a winner of this Promotion, you agree that the Promoter may use your name, image and town or county of residence to announce the winner and for any other reasonable and related promotional purposes. By entering this Promotion, all participants will be deemed to have accepted that they are bound by the Terms and Conditions. Events may occur that render the competition itself or the awarding of the prize impossible due to reasons beyond the control of the Promoter and accordingly the Promoter may at its absolute discretion vary or amend the promotion and the entrant agrees that no liability shall attach to the Promoter as a result thereof. The promoter is Branston Ltd, Mere Rd, Branston, Lincoln LN4 1NJ. January is often defined by three things: darker nights, empty wallets and the ‘New Year, New Me’ resolutions. Of the thousands of challenges set in the new year, one of the clear winners for sheer numbers of participants is Veganuary – a month of not only vegan eating, but adopting a wholly vegan lifestyle.